Seeking experienced, energetic, customer service-oriented Medical Assistant with X-Ray NCT certification to work at our Urgent Care Center. Our preferred candidate will have a minimum of one year experience as an MA and be NCT certified, with experience. Front office experience is a plus, but not required. Enjoy a fast paced team environment which makes for a fun place to work! DOT Urine drug screen experience is a plus, but not required. Send cover letter and resume to Khristina Pierce, kpierce@planouc.com or drop off at either clinic. Caring for all ages; children, adults and seniors. Before Royse City Urgent Care opened, patients in this area were well served by the caring staff at Rockwall Urgent Care. The company has been actively involved in the Royse City and surrounding communities since June of 2010. We actively participate in area events to give back to the community that has supported us so well. To that end, we have aligned ourselves with many local businesses/entities, sporting clubs, and non-profit organizations. City of Royse City: We provide occupational medicine services to city employees. Royse City ISD: We provide occupational medicine services to school district employees. We also support the athletic programs. Sabine Creek Ranch: Since we opened, we’ve provided medical coverage for this local camp and event venue. If you are looking for a reliable and available provider in Royse City and the surrounding areas, then Royse City Urgent Care has you covered. We are a family-friendly urgent care clinic that offers medical services for children, seniors and adults. Rather than sitting for hours in a hospital waiting room, our urgent care clinic offers the convenient option of walk-in medical care. When you walk into to Royse City Urgent Care, a trained and knowledgeable member of our team will help you immediately. All of our physicians have years of experience when it comes to providing family health care and emergency medicine care. Royse City Urgent Care offers a large variety of services, whether you need help with a sprained ankle or a bad case of bronchitis. We also offer walk-in physicals on-site at our clinic. 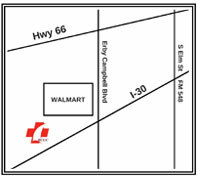 Royse Urgent Care is conveniently located at 576 W. I-30, Royse City, TX 75189. We also offer services to the surrounding areas, including Greenville, Caddo Mills, Quinlan, Fate, Union Valley and Terrell. Visit our patient services page for a list of illnesses and injuries we treat. Caring for our neighbors, partnering with our community. We’re here when you need us. 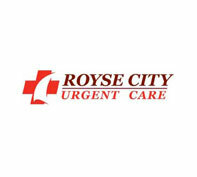 Royse City Urgent Care is locally owned and operated. Our physician owners and each member of our staff strongly believe in treating our patients the way we would want to be treated. We take very seriously the trust that you place in us when you come to us for your healthcare needs. We will strive daily to provide more than mere convenience. Rather, we will approach each encounter carefully and empathetically to ensure your issue is managed with thoughtful consideration. That starts with nurturing an environment worthy of your confidence. Our friendly staff will greet you warmly and serve you promptly. They will take time to explain our transparent and straightforward billing processes. Our clinic is open 7 days a week so that we can care for our community because we know that life’s accidents and illnesses don’t come at a convenient time. As you meet with our providers, you will see that we take in offering an extremely high quality of care. We consider it vitally important that your concerns are listened to and addressed in a professional and proficient manner. We are committed to providing you with excellent and swift care, without sacrificing the focus and attention your needs deserve. Ultimately, we are part of the Royse City community, and we count it a privilege to be able to partner with you in your health. We will help to get you on the road to recovery, but we’ll also seek to contribute meaningfully to our community. We care very much about your entire experience at our facility and we take special care to ensure your outcome is favorable. Should any problems arise, we will be diligent in resolving them fairly and efficiently. We know that you have a choice of where you receive your care, so we sincerely endeavor to harness our talents and expertise to meet the needs of people of the Plano area with pride. At Royse City Urgent Care, we make it our mission to serve you and your family with a passion for compassionate care!